Mimasu IX also performed under the name Kawarazaki Gonjūrō I (河原崎権十郎) and later as Ichikawa Danjūrō IX. Shibaraku is not a play unto itself, but a short drama inserted during interludes or in between full plays to provide variety and maintain a certain level of energy and interest on the part of the audience. The plot centers around the figure of Kamakura Gongorō Kagemasa, who has become the stereotypical bombastic hero of the kabuki stage, with red-and-white striped makeup and strong, energetic movement. The historical Kamakura Kagemasa is famous for his bravery for having continued to fight after losing an eye in battle in the Gosannen War (1083-1087). The climactic moment of this short work takes place when a goodly samurai is being assaulted by a number of villains. Kagemasa shouts "Shibaraku!" (Stop a moment!) loudly from behind a curtain (agemaku) and then steps out onto the hanamichi (a raised platform extending through the audience to the stage) in magnificent costume and makeup. Arriving at the stage, he sits on a stool (aibiki) and, in a special kind of monologue called tsurane, explains his story. He then drives the villains off and, as the curtain falls, greets the audience from the hanamichi, not as the hero, but as the actor. The work is derived from an actual occurrence involving Danjūrō I. On this particular occasion, when his fellow actors refused to give him his cue to make his entrance, Danjūrō dramatically shouted "Shibaraku! ", and stepped onto the hanamichi, making his entrance. Illustrated in a full-page, color reproduction in The Art of Japanese Prints by Richard Illing, 1980, p. 48. 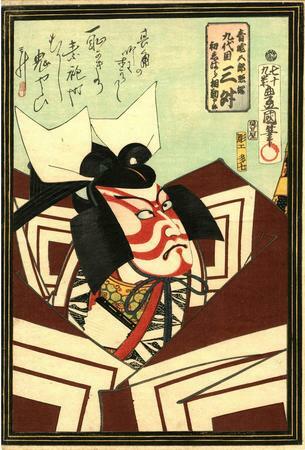 "Published shortly before Kunisada's death, this print is signed Shichijukyu-sai Toyokuni hitsu ('from the brush of the seventy-nine-year-old Toyokuni'). A poem in the actor's own hand is printed at top left, signed with his poetry name, Sansho. Kunisada had depicted successive generations of the Ichikawa lineage of actors in the role of Gongoro in Shibaraku!, which was one of the great examples of the 'rough-stuff' style (aragoto) for which the Ichikawa line of actors was famous. 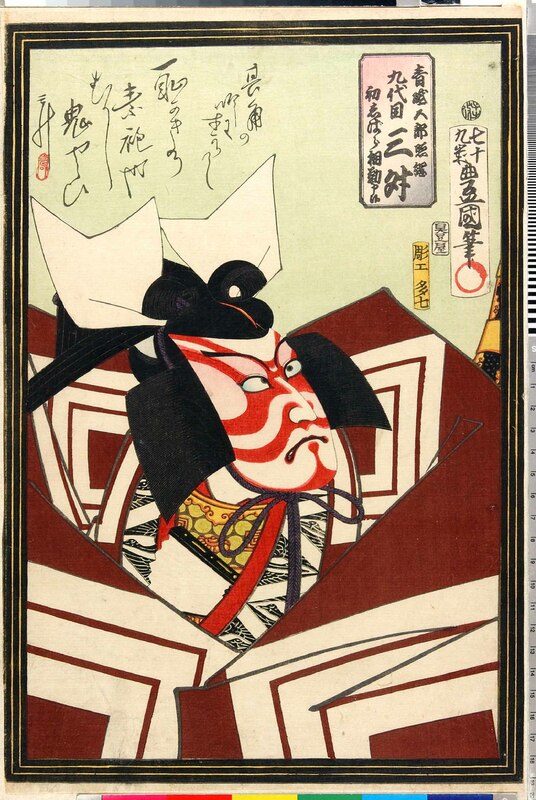 All of Kunisada's prints depict the moment of the character's entrance, one of the highpoints of all kabuki. Narita Goro is on the point of executing the innocent Yoshitsuna and his fiancée, when the voice of Gongoro comes from the rear of the theatre shouting 'Shibaraku! Shibaraku!' ('Stop right there!'). The hero then strides onto the hanamichi passageway leading through the audience, wearing the most extravagant costume: a voluminous suo ('plain sliding-door') robe, with the Ichikawa crest (mon) of triple-rice-measures (mimasu) adorning square sleeves so wide that they have to be supported with splints."